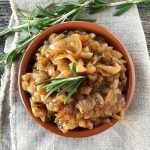 Made with caramelized onions, garlic, rosemary and balsamic vinegar, this Roasted Garlic & Rosemary Onion Jam SO delicious. It’s sweet, tart and a perfect accompaniment to cheese, bread, roasted meats and more. First roast your garlic (you need an hour to roast the garlic). Refer to my previous post on Roasting Garlic, to find out how to do this. Cut your onions in half, then slice them about 1/4 inch wide. Heat up the oil in a stock pot, then add the onions. Mix well, until the onions are covered with the oil. Cook on medium heat until the onions are softened. About 20 minutes. Then add the rosemary stems and bay leaves. Mix. Cook for about 20 more minutes, until the rosemary has wilted. Once the rosemary is wilted, remove it and the bay leaves. You will likely have to remove stray rosemary leaves. Add the balsamic vinegar, sugar, salt and pepper. Add the roasted garlic by scooping out the cloves, and mash them into the onion mixture. Cook until the liquid is all gone, but be very careful not to burn it! Stir often!! When the onions are cooked, the liquid is gone, and the mixture is sticky it’s all done! Put into sterilized jars and keep in the fridge for up to 2 weeks.